"I discovered this recipe when I was pregnant with my first child. This is the only meatloaf recipe my family allows me to make still. It can be frozen ahead." Mix ground beef, quick oats, onion, milk, eggs, 1/4 cup ketchup, parsley, garlic, salt, basil, and black pepper together in a large bowl until thoroughly combined; pat the mixture into a 9x5-inch loaf pan. 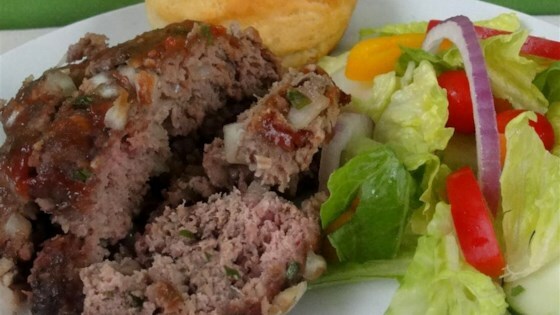 Bake meatloaf in the preheated oven until firm and no longer pink inside, 1 to 1 1/4 hours. An instant-read meat thermometer inserted into the center of the meat loaf should read at least 160 degrees F (70 degrees C). Remove from oven, spread 2 tablespoons ketchup over loaf, and top with Cheddar cheese slices; return to oven and bake until cheese has melted, about 5 more minutes. If you wish to freeze, bake as directed for one hour, remove from oven and cool. Refrigerate until well chilled, wrap, label and freeze. To reheat: unwrap meat loaf and bake 1 hour at 350 degrees F (175 degrees C). Top with ketchup and cheese and bake additional 5 minutes. looks pretty good but I don't use cheese on mine.Top with a can of vegetarian soup and let it cook in.I also love olives so will add some green garlic stuffed olives also. This is my recipe except I use 1# ground beef and 1# ground pork. Love the oats.